Posted by Its almost Easter, and folks usually love roasting a turkey in their ovens around this time. Since I've made a few turkeys over Christmas (easy brine and roast a turkey recipe here), I wanted something different. So, in February, I started experimenting with lamb. I love tender melt in your mouth lamb with most of its gaminess masked by fresh herbs. 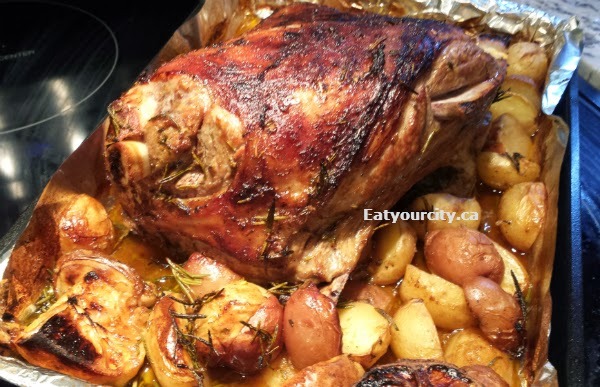 I absolutely adore slow roasted lamb, especially if its done with Greek flavors. My preference is to eat lamb at a rare to medium rare. And though I'm usually pretty patient, I didn't feel like waiting while the roast sloooooow roasted for 3+hours every single time I craved a lamb roast. We all have better things to do than babysit a roast for hours. So, I tweaked a 3hours+ slow roasted recipe lamb shoulder roast to be done in (much more reasonable) 1 hour of roasting time. I wanted lots of flavor, so solved that by marinating the roast overnight to infuse it with plenty of fresh herbs, garlic and to tenderize in olive oil. I also wanted a one pan meal (less mess and I'm lazy/efficient! ), so tossed in potatoes, and a pan of carrots on the side (Next time I'll remember to use a huge pan and then you can do everything in one single pan). The result... it takes a bit of planning as the roast needs to marinate overnight in the fridge, come to temperature for about 30min, BUT then you can kick back as the lamb roasts and fills your house with the delicious scent of roasted herbed lamb for the next hour! 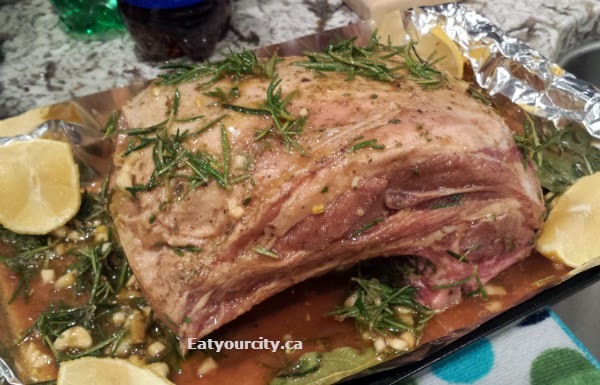 If you prefer slow roasted lamb and have 3+ hours, you can use the same recipe, just remember to wrap the entire roast and pan with foil to seal in the steam and juices and up the roasting time to well... 3 hours. 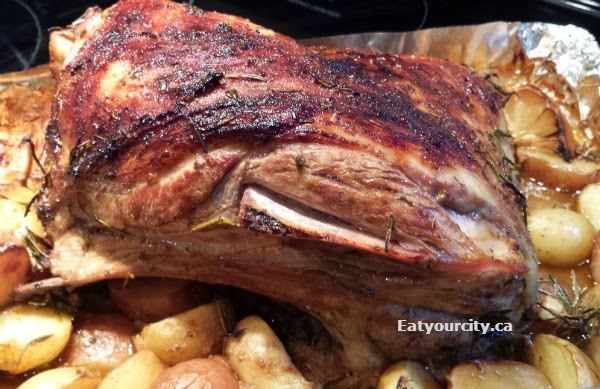 And one more thing before the recipe, a great place to look up how to carve a lamb shoulder (or any other cut of lamb) along with a how long to roast lamb guide here. 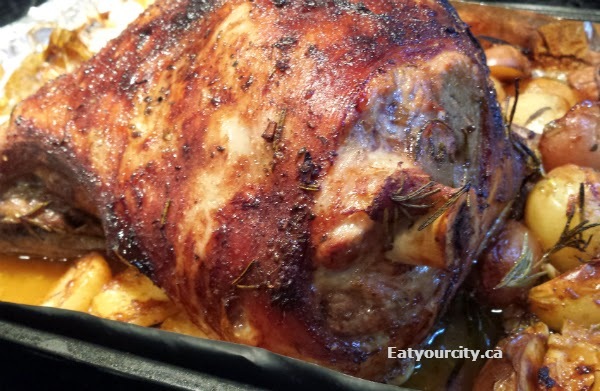 This recipe works also for a leg of lamb.. I had purchased lamb shoulders cuz it was on sale, so I'll refer to shoulder of lamb in this post. I used a convection (fan) oven, so I relied on a meat thermometer since it usually cooks my roasts a heck of a lot faster than say my mom's regular conventional oven. I should have read the cooking guide a bit closer and made one simple slice while the roast was raw to make it easier to carve later, but it was still pretty easy to carve once it was cooked none the less. So after marinating the roast overnight, take it out of the marinade and arrange fat side up in a lined roasting pan, squish the lemon juice over the lamb and toss the lemon wedges in. Once your roast as come to temperature, and your oven is preheated to 450F, toss the roast in for 10min to sear all the lovely flavors in. The fatty portion should be nice and golden. Remove from oven and turn down the oven to 350F. Using oven mitts to prevent burns, insert your oven safe meat thermometer. If your meat thermometer can with stand past 450F, great, but most oven safe meat thermometers don't like temperatures that high (don't want to melt it!) and it gives your wide open oven a few minutes to cool down to 350F. I'm paranoid so I use two - an ordinary one (that is dishwasher safe - yes!) like this oven safe meat thermometer as well as an electronic digital one that yells at me when the bird is done. Cover the roast with a piece of foil - careful not to have it touch the meat thermometer, then plunk it back in to roast to your liking. I had a 5lb bone in roast, and it took 1hour total oven time (10 min sear, 50min roast) for medium rare... but it works out to about 15 min/lb in my oven... refer to the timing guide here for regular ovens and always use an oven safe meat thermometer, because the size and temperature of your meat when you toss it into the oven will vary... so your cooking time will vary! I usually take my roast out 10degrees prior to it being done to the "cooked doneness" level, cuz as you rest it for 10minutes, the internal temperature usually goes up 10-15 degrees. Feel free to fish out the potatoes and roasted vegetables (if using), and discard bay leaves. You can save the lemons for a garnish if you like. Pour the roasting juices into a bowl and skim off the fat. You can serve as au jus, or thicken it into a gravy by dumping it into a pot, heating it up and adding a little bit of cornstarch in cold water. Once the roast has rested to distribute its yummy juiciness all throughout the roast, and has cooled down enough to handle to carve... carve, plate and enjoy! 1) In a small bowl, run your fingers down the rosemary and thyme stems to free all the soft herby bits and leaves into the bowl. Add in all the dry spices and mix well. If you like you can pestle and mortar this into a paste, but I usually don't bother cuz I'm lazy... making it into a paste give the roast more herb flavor. 2) In a large glass or plastic (non-reactive) bowl, place lamb roast in, add all marinade ingredients in, and massage the marinade into every nook and cranny. Flip the lamb roast so the meatiest side faces down in the marinade. Cover with plastic wrap and pop into your fridge overnight, or up to 2 days. 1) Take the roast out and put it into a large lined pan. Squish the lemons over the roast (discard lemon seeds), and place the remaining marinade, broth, vegetables and lemon wedges into the pan. Let rest for 30min at room temp. 2) Preheat oven 500F, place roast in for 10 min. Remove roast and turn down oven to 350F. 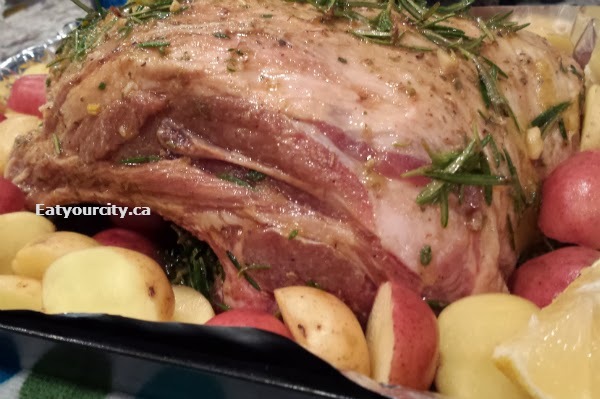 3) Cover the roast with foil loosely, insert oven safe meat thermometer and pop back in oven to roast to however cooked you like your roast to be. 4) Take out the roast 10 degrees before its done, and leave covered with foil to rest for 10minutes. 5) In the meantime, fish out your potatoes and vegetables, discard the bay leaves, drain the juices into a bowl and skim off the fat on top for au jus, or make a simple gravy by heating up the juices and thicken with 1-2 tablespoons of cornstarch dissolved in 1-2 tablespoons cold water. *Optional* If you prefer a super slow roasted version, after searing the roast, turn down the oven to 300F, completely seal and wrap the roast plus the roasting pan in foil (acts as a lid) and roast for 3 hours or until the well done meat just falls off the bone.